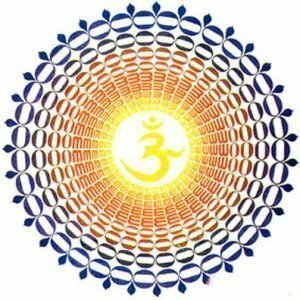 OM Healing is an ancient ritual from India that harnesses the power of the audible OM chant for the purposes of healing on all levels of being (primarily for the benefit of those in the group but there is also an ‘absent healing’ aspect). A technique that utilises this power was made public in 2007, the aim of which is to help the practitioner through the activation of his/her own self-healing capacities. It does not replace medical treatment or therapy nor does it offer any guarantee of beneficial results. OM Healing at the Dhyana Centre takes place weekly at 8.10pm on Fridays and consists of 45 minutes of audible chant. These sessions start promptly and there is no late admittance so punctuality is essential: they are open to the public without booking but first-time attendees are welcome to email the Centre in advance. Meditation first @ 7pm: the chant session follows an optional silent group meditation for 40 minutes which starts at 7pm. Visitors for the healing are also welcome to participate in the meditation or may come solely for the healing, in which case they should arrive between 7.50pm and 8.10pm (not before or after). Preparation & briefing: no preparation is required for the OM Healing and there is no dress code: we sit on chairs not the floor. A full verbal briefing will be given to any newcomers before each chant session starts (and it is necessary for all first-timers to attend this). coming also for the meditation are expected to be able to participate in a silent and still group sitting for up to 40 minutes (it is possible to join the session just for the healing. Participation in the meditation is entirely optional). An interesting article on the power of the OM chant can be viewed here. 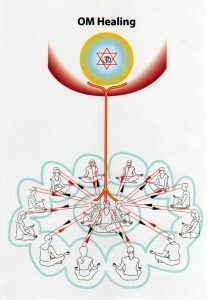 This artist’s impression gives a clear representation of the OM Healing circle and the interactive energy flows involved (with grateful acknowledgement to Bhakti Marga US). will be Sunday 19th May, open to all. Click here for more details and/or to make a booking. This up-to-date calendar details the Centre’s daily sessions. A newsletter is emailed to subscribers in the last week of each month. The latest version can be seen here.